The Scott Tidal 907-4 is a gorgeous caster with ideal power for redfish, bonefish and other inshore species such as sea trout and small snook. The Tidal 907-4 is also a terrific rod for largemouth and smallmouth bass. I just got off the casting pond at IFTD, Orlando. We tested every rod in the Tidal series with some standard saltwater lines. The Tidal 907-4 is lighter and more crisp than almost any other 7 weight. I can’t overstate the ease of casting this fine feeling fly rod. It was immediately evident that this is a true saltwater rod, not an all-purpose crossover rod. The fast action and low swing weight makes the 907-4 feel like nothing more than vapors in your hand. When cast side-by-side with equivalent models in the S4S and Radian Series, the Tidal kept up until I really leaned on it. When you need the most power, Radian and S4S can go to another level. In most casting situations, the angler will find the 907-4 to be much more than adequate. 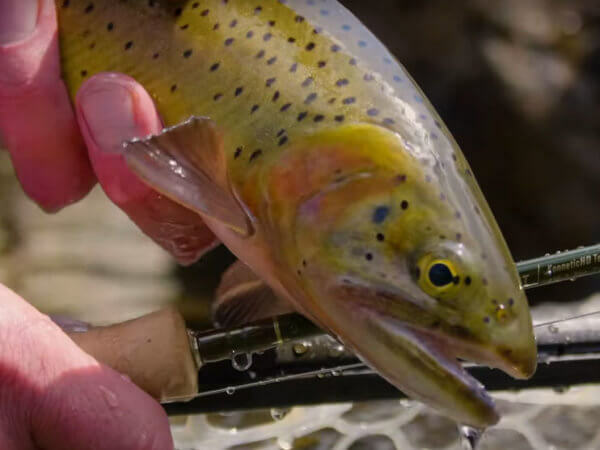 This is easily a $600-$700 fly rod. Honestly, it’s that good. Line suggestions: All Tidal Series rods will tolerate a wide range of lines. They flex very evenly and respond to different casting strokes with similar effects on the loops. I recommend the Rio Bonefish (but not the quickshooter, which is a full line weight heavy), the SA Bonefish, SA Textured Saltwater and SA Sharkwave Saltwater lines.